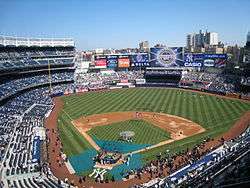 The Yankees have played home games in the current Yankee Stadium since 2009. The New York Yankees are a professional baseball team based in the Bronx, a borough of New York City, New York. Also known as "the Bronx Bombers" and "the Pinstripers", the Yankees play in the East Division of Major League Baseball's (MLB) American League (AL). In its 114 major league seasons, the franchise has won 27 World Series championships, the most of any MLB team and 16 more than the second-place St. Louis Cardinals. The Yankees played home games in Yankee Stadium from 1923 to 2008, except for a stint at Shea Stadium from 1974 to 1975 while Yankee Stadium was undergoing renovations. In 2009, the team moved into a new ballpark, which is also called Yankee Stadium. The Baltimore Orioles began play in the AL in 1901. After two seasons, the Orioles were replaced by a club in New York City; it is unclear whether it was an expansion team or a relocated version of the Orioles. Frank Farrell and William S. Devery purchased the franchise, naming it the New York Highlanders. In 1913, the team changed its name to the Yankees. From 1921 to 1964, the Yankees were the most successful Major League franchise, winning 20 World Series titles and 29 AL pennants. This period included streaks of four consecutive championships from 1936 to 1939 and five straight titles from 1949 to 1953. Following an 11-year playoff drought, the club appeared in the playoffs five times in a six-year period and won back-to-back World Series championships in 1977 and 1978. The Yankees won the World Series again in 1996, and in 1998 began a run of three consecutive Series titles. From 1995 to 2007, the Yankees made the playoffs each year; their 13-season postseason streak was the second-longest in MLB history. After missing the playoffs in 2008, they won another World Series in 2009 and reached the postseason each year from 2010 to 2012. In the most recent MLB season, 2016, New York had an 84–78 record and did not qualify for the playoffs. Overall, the Yankees' .569 regular season winning percentage is the highest of any MLB team, and they have the eighth-most regular season wins, behind seven clubs founded in the 19th century. Babe Ruth and Lou Gehrig led the Murderers' Row teams of the late 1920s. These statistics are from Baseball-Reference.com's New York Yankees History & Encyclopedia, except where noted, and are current as of October 3, 2016. The following table describes the Yankees' MLB win–loss record by decade. These statistics are from Baseball-Reference.com's New York Yankees History & Encyclopedia, and are current as of October 18, 2016.
a This is determined by calculating the difference in wins plus the difference in losses divided by two. b For lists of all American League pennant winners, see American League pennant winners 1901–68 and American League Championship Series. c Half-game increments are possible because games can be cancelled due to rain. If a postponed game is the last of the season between two teams in one of their stadiums, it may not be made up if it does not affect the playoff race. d The second game of the series ended after 10 innings due to darkness, with the score tied 2–2. e During Game 3 of this series, Babe Ruth hit his called shot, a home run into the center field bleachers of Wrigley Field. f Don Larsen pitched the only perfect game in World Series history in Game 5.
g In 1969, the American League split into East and West divisions. h The 1972 Major League Baseball strike forced the cancellation of the Yankees' first seven games of the season. i The Yankees finished the season tied for first with the Boston Red Sox. New York defeated the Red Sox 5–4 in a one-game playoff to clinch the division title. The game is best remembered for Bucky Dent's three-run home run in the seventh inning, which gave the Yankees a 3–2 lead. j The 1981 Major League Baseball strike caused the season to be split into two halves. The Yankees were given a berth in an expanded playoff tournament because they led the American League East when the strike began. The Milwaukee Brewers finished the second half in first place to earn the division's other playoff berth. l The 1994–95 MLB strike lasted until April 2, 1995, causing the shortening of the 1995 season to 144 games. m The Yankees finished the season tied for first with the Boston Red Sox, but were awarded the division title because they won the season series with the Red Sox. n The Yankees finished the season tied for third with the Baltimore Orioles. "Complete Baseball Team and Baseball Team Encyclopedias". Baseball-Reference.com. Retrieved August 13, 2008. "Baseball-Reference Postseason Index". Baseball-Reference.com. Retrieved August 13, 2008. "New York Yankees: History". CBS Sports. Retrieved July 3, 2009. "New York Yankees year-by-year results". New York Yankees. Retrieved July 3, 2009. Appel, Marty (2012). Pinstripe Empire: The New York Yankees From Before the Babe to After the Boss. Bloomsbury Publishing. ISBN 978-1-60819-492-6. Tygiel, Jules (2000). Past Time: Baseball as History. Oxford University Press. ISBN 978-0-19-514604-2. ↑ "Bronx Bombers to be sold?". CNN. CNNfn. March 19, 1998. Retrieved July 27, 2008. ↑ Antonen, Mel (October 17, 2004). "Pinstripers paint Red Sox blue". USA Today. Retrieved July 27, 2008. ↑ "World Series Winners". ESPN. Retrieved July 27, 2008. ↑ "Yankee Stadium History". New York Yankees. Retrieved July 27, 2008. ↑ Bondy, Filip (April 3, 2009). "Yankees need to win big to justify excesses of new Yankee Stadium". New York Daily News. Retrieved April 5, 2009. ↑ Tygiel, pp. 49, 51. 1 2 "Yankees Timeline: 1903–1925". New York Yankees. Retrieved February 14, 2015. ↑ Hoch, Bryan (September 23, 2008). "Yankees' playoff run one for the ages". Major League Baseball. Retrieved October 11, 2008. ↑ "Complete Baseball Team and Baseball Team Encyclopedias". Baseball-Reference.com. Retrieved November 11, 2009. ↑ "1921 World Series". Baseball-Reference.com. Retrieved July 26, 2008. ↑ "1922 World Series". Baseball-Reference.com. Retrieved July 26, 2008. ↑ "1923 World Series". Baseball-Reference.com. Retrieved July 26, 2008. ↑ "Babe Ruth". Baseball-Reference.com. Retrieved July 26, 2008. ↑ "1926 World Series". Baseball-Reference.com. Retrieved July 26, 2008. ↑ "1927 World Series". Baseball-Reference.com. Retrieved July 26, 2008. ↑ "Lou Gehrig". Baseball-Reference.com. Retrieved July 26, 2008. ↑ "1928 World Series". Baseball-Reference.com. Retrieved July 26, 2008. ↑ "1932 World Series". Baseball-Reference.com. Retrieved July 26, 2008. ↑ "1936 World Series". Baseball-Reference.com. Retrieved July 26, 2008. 1 2 3 4 5 6 7 8 9 10 11 12 13 14 15 16 17 18 19 20 "Most Valuable Player winners". Major League Baseball. Retrieved July 26, 2008. ↑ "1937 World Series". Baseball-Reference.com. Retrieved July 26, 2008. ↑ "1938 World Series". Baseball-Reference.com. Retrieved July 26, 2008. ↑ "1939 World Series". Baseball-Reference.com. Retrieved July 26, 2008. ↑ "1942 World Series". Baseball-Reference.com. Retrieved July 26, 2008. ↑ "1943 World Series". Baseball-Reference.com. Retrieved July 26, 2008. ↑ "1947 World Series". Baseball-Reference.com. Retrieved July 26, 2008. ↑ "1949 World Series". Baseball-Reference.com. Retrieved July 26, 2008. ↑ "1950 World Series". Baseball-Reference.com. Retrieved July 26, 2008. ↑ "1951 World Series". Baseball-Reference.com. Retrieved July 26, 2008. 1 2 3 4 5 6 7 8 "Rookie of the Year winners". Major League Baseball. Retrieved July 26, 2008. ↑ "1952 World Series". Baseball-Reference.com. Retrieved July 26, 2008. ↑ "1953 World Series". Baseball-Reference.com. Retrieved July 26, 2008. ↑ "1955 World Series". Baseball-Reference.com. Retrieved July 26, 2008. ↑ "1956 World Series". Baseball-Reference.com. Retrieved July 26, 2008. 1 2 3 4 5 6 7 8 9 10 11 12 "MLB Awards – World Series MVP". ESPN. Retrieved May 27, 2011. ↑ "1957 World Series". Baseball-Reference.com. Retrieved July 26, 2008. ↑ "1958 World Series". Baseball-Reference.com. Retrieved July 26, 2008. 1 2 3 4 5 "Cy Young Award winners". Major League Baseball. Retrieved July 26, 2008. ↑ "1960 World Series". Baseball-Reference.com. Retrieved July 26, 2008. ↑ "1961 World Series". Baseball-Reference.com. Retrieved July 26, 2008. ↑ "1962 World Series". Baseball-Reference.com. Retrieved July 26, 2008. ↑ "1963 World Series". Baseball-Reference.com. Retrieved July 26, 2008. ↑ "1964 World Series". Baseball-Reference.com. Retrieved July 26, 2008. ↑ "1976 New York Yankees". Baseball-Reference.com. Retrieved July 26, 2008. ↑ Down, Fred. "Dock Ellis Is Voted AL's Comeback Player Of Year". Florence Times—Tri Cities Daily. p. 20. Retrieved October 28, 2015. ↑ "1977 New York Yankees". Baseball-Reference.com. Retrieved July 27, 2008. ↑ "1978 New York Yankees". Baseball-Reference.com. Retrieved July 27, 2008. ↑ "1980 AL Championship Series". Baseball-Reference.com. Retrieved July 27, 2008. ↑ "1981 New York Yankees". Baseball-Reference.com. Retrieved July 27, 2008. 1 2 3 "Manager of the Year winners". Major League Baseball. Retrieved July 27, 2008. ↑ "1995 AL Division Series". Baseball-Reference.com. Retrieved July 27, 2008. ↑ "1996 New York Yankees". Baseball-Reference.com. Retrieved July 27, 2008. ↑ "1997 AL Division Series". Baseball-Reference.com. Retrieved July 27, 2008. ↑ "1998 New York Yankees". Baseball-Reference.com. Retrieved July 27, 2008. ↑ "1999 New York Yankees". Baseball-Reference.com. Retrieved July 27, 2008. ↑ "2000 New York Yankees". Baseball-Reference.com. Retrieved July 27, 2008. ↑ "All-Star MVPs". Major League Baseball. Retrieved June 20, 2011. ↑ "2001 New York Yankees". Baseball-Reference.com. Retrieved July 27, 2008. ↑ "2002 AL Division Series". Baseball-Reference.com. Retrieved July 27, 2008. ↑ "2003 New York Yankees". Baseball-Reference.com. Retrieved July 27, 2008. ↑ "2004 New York Yankees". Baseball-Reference.com. Retrieved July 27, 2008. ↑ "2005 AL Division Series". Baseball-Reference.com. Retrieved July 27, 2008. ↑ "Griffey, Giambi named comeback players of '05". ESPN. Associated Press. October 6, 2005. Retrieved July 27, 2008. ↑ "2006 AL Division Series". Baseball-Reference.com. Retrieved July 27, 2008. ↑ "2007 AL Division Series". Baseball-Reference.com. Retrieved July 27, 2008. ↑ "2009 New York Yankees Batting, Pitching, & Fielding Statistics". Baseball-Reference.com. Retrieved November 6, 2009. ↑ Matthews, Wallace (November 5, 2013). "Rivera wins comeback player award". ESPN. Retrieved December 5, 2015. 1 2 "New York Yankees History & Encyclopedia". Baseball-Reference.com. Retrieved October 6, 2015. ↑ Bodley, Hal (February 18, 2007). "Ties in baseball called out by rules committee". USA Today. Retrieved November 9, 2009. ↑ "History of the World Series – 1922". Sporting News. Internet Archive. Archived from the original on June 27, 2008. Retrieved October 2, 2011. ↑ Bock, Hal (September 27, 2007). "Monday marks 75th anniversary of Babe Ruth's called shot against Cubs in World Series". USA Today. Retrieved July 30, 2008. ↑ Haberman, Clyde (October 3, 2006). "Immortalized by a Moment of Perfection". The New York Times. Retrieved August 13, 2008. ↑ Leggett, William (April 14, 1969). "One Hundred And One". Sports Illustrated. Archived from the original on February 2, 2012. Retrieved October 28, 2015. 1 2 "Baseball stoppages date back to 1972". ESPN. Associated Press. August 29, 2002. Retrieved March 4, 2009. ↑ Fratus, Ken (September 29, 2003). "25 years ago: How an otherwise forgettable shortstop became a permanent Dent in Boston's heart". The Boston Globe. Retrieved July 30, 2008. ↑ "1981 Season". ESPN. Retrieved July 30, 2008. ↑ "Strike looms large over All-Star Game". CNN Sports Illustrated. Associated Press. July 7, 2002. Archived from the original on December 18, 2005. Retrieved October 28, 2015. ↑ Newhan, Ross (October 6, 1994). "A Season Without Titles – Baseball: Players will be honored, but there will be no divisional champions because of the shortened schedule". Los Angeles Times. Retrieved September 15, 2009. ↑ "1994 Season". ESPN. Retrieved July 30, 2008. ↑ "Red Sox clinch berth, make Yanks' playoff road tougher". ESPN. Associated Press. October 2, 2005. Retrieved July 30, 2008. ↑ "MLB Standings – 2013". ESPN. Retrieved October 11, 2013.